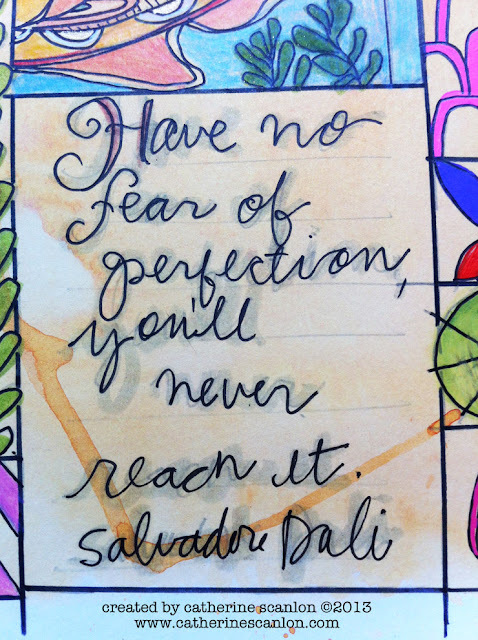 The size of this stencil is 9 x 12 but the journal page I used it on for this post is 7 1/2 x 11. I love how it breaks the page into nice little grids that are perfect for little mini-journal pages. 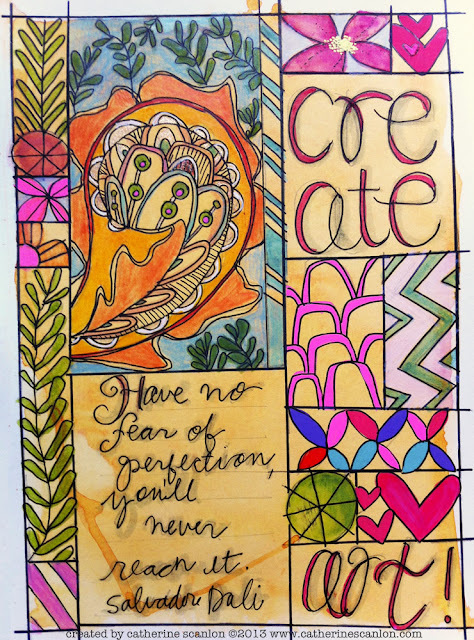 To create this page I positioned the stencil on the journal page and used my pencil to draw in the grid lines and drew a variety of designs or words in each section of the grid. LOVE that is such an easy way to get started with a journal page. The little sections are perfect for little works of art. Plus, I can have a short attention span and it's ok. I wanted this page to have a fall look to it, so I mixed the Orange Silks with water and brushed a light wash over the entire grid. I did get a few drippy drips here and there -- I love the way they look. When the silk wash was dry I went to work with Gelli Pens, colored pencils, brush markers, and watercolor crayons to add lots of pops of color to each design. I also outlined all the pencil lines and added a quote with a black marker. While this is not perfect in any way -- drips here and there -- colored over lines and other little imperfections -- I am totally in love with the way this turned out. Salvadore, you couldn't have said it any better! 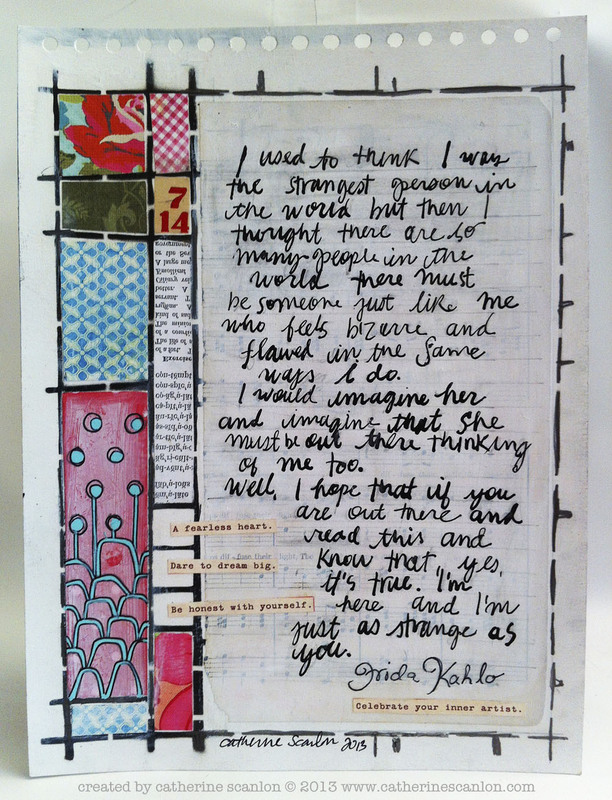 Here's another journal page I created with the Grid Stencil. This time I collaged different types of papers on the left side and added a favorite quote from Frida Kahlo on the right. The scraps of paper I pulled out of my scrap bin -- love the look of this and it came together so fast. Grid of Perfection, hmmm. It just might be. THANKS for stopping by today. Have a great day and I'll be back next week with my last guest design post for eclectic Paperie. Oh, I MUST have this stencil! I love what you've created with it, Catherine! I bought this stencil from Art Gone Wild. Love it! 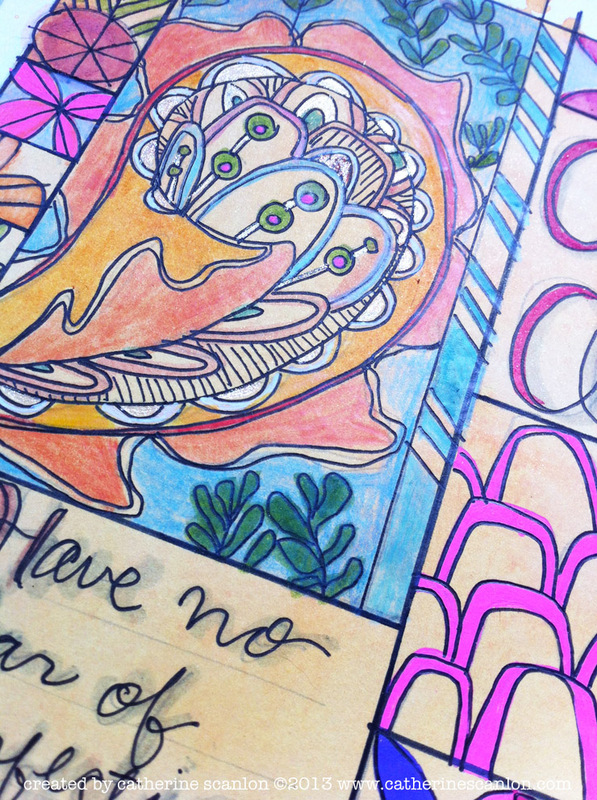 It makes great art journal pages so easy. Wow, love the grids. Wonderful art journal page. I have just got to have this stencil, must start a journal and I love what you have done with this page!!!! This is so cool! Love the stencil! !